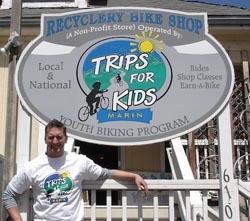 Trips for Kids (TFK) recently hired Andy Phelps to be its new Re-Cyclerly Bike Shop manager. Phelps joins TFK with years of experience in retail bike shops ready to oversee the renovation of the Re-Cyclery Bike Shop located at TFK's national headquarters in San Rafael, Calif.
As a certified bicycle technician and former sergeant in the U.S. Marine Corps, Phelps is well equipped to enhance the bike shop's programs and profitability. Phelps has been decorated throughout his bike and military careers with the U.S. Marine Corps NCO of the Year Award, Navy Achievement Medal and the REI Brentwood-Antioch Anderson Award. Phelps also holds a B.A. in speech communications from Edinboro University. The Re-Cyclery Bike Shop offers classes, runs an Earn-A-Bike program and sells bikes, clothing and equipment donated by companies in the San Francisco Bay Area and TFK sponsors. Proceeds from the Re-Cyclery Bike Shop provide TFK two-thirds of its national funding. The TFK Re-Cyclery Thrift Shop is located at 610 Fourth Street, San Rafael, Calif., and is open Tuesday through Friday, 12 p.m. to 6 p.m. and Saturday and Sunday, 10 a.m. to 4 p.m.
For more information about TFK, please visit tripsforkids.org or call Marilyn Price at 415.458.2986. Trips for Kids (www.tripsforkids.org) is a nonprofit 501(c)3 organization based in Marin County, Calif. With 60-plus chapters operating in the United States, Canada and Israel, Trips for Kids opens the world of cycling to at-risk youth through mountain bike rides and Earn-A-Bike programs. Trips for Kids started in 1988 as a grass roots effort by avid mountain biker, environmentalist and Mountain Bike Hall of Fame inductee Marilyn Price to provide inner-city youth a way to enjoy the outdoors and gain much-needed life skills.